Dominik Baumann lined up at a very special track, the Laguna Seca Raceway, for the penultimate round of the IMSA WeatherTech Sportscar championship last weekend. The Californian circuit has hosted the MotoGP motorcycle world cup a number of times, but Laguna Seca is best known for its challenging ‘Corkscrew’ turn. However, a lack of grip took the edge off their outing at the track for Baumann and 3GT Racing, as the Lexus RC F GT3 skidded frequently, causing tyres to degrade badly. Baumann and team-mate Kyle Marcelli struggled early on in first practice but managed to improve on eighth and ninth in the first two practice sessions to finish fifth in the final session. Qualifying also went well with sixth place, however, 3GT Racing were unable to put up much of a fight against the competition in the race. 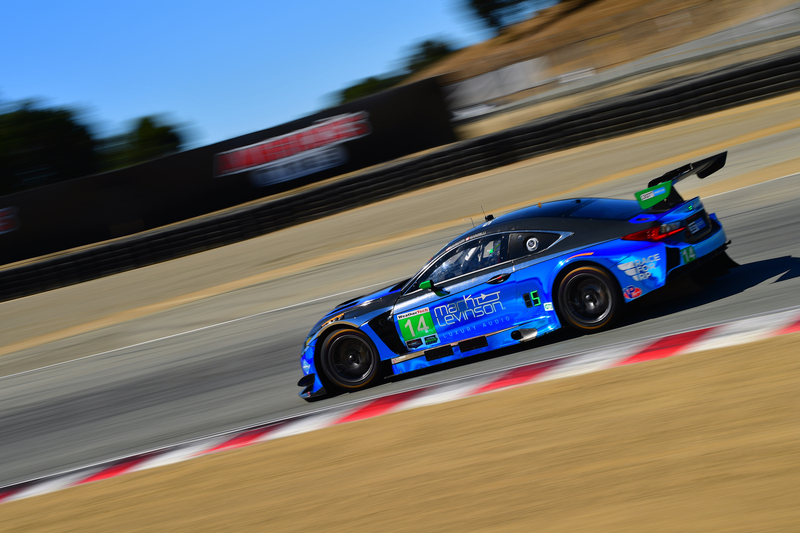 Tenth place in the GTD class at the Continental Tire Monterey Grand Prix was not the result they had hoped for. Austrian driver Baumann has now returned to Europe to compete for R-Motorsport in the season finale of the Blancpain GT Series Endurance Cup in Barcelona (September 28th to 30th). He finished sixth in last year’s race and is therefore optimistic about his chances at the Circuit de Barcelona-Catalunya. Why was the weekend such a struggle for you? Laguna Seca was the toughest circuit yet for our car. Unfortunately, both of our team’s cars were uncompetitive all weekend. We didn’t even manage to be fast over one complete lap and were also slow in race trim. We knew from last year that it would be tricky but thought we’d found a solution to the car’s problems, and besides, the tyres are slightly different to those used in 2017. Nevertheless, we had very little in the way of performance. We still have to analyse the data, but at any rate, the circuit doesn’t suit us. It has very little grip, which meant we were spinning and slipping around a lot more, badly affecting tyre wear as a consequence. The track characteristics simply did not suit. Why is that? Why doesn’t the track layout suit the Lexus? The track only has medium fast and slow turns with no really fast corners. The last turn before the main straight is a very slow one, which is bad for us, especially in combination with the long straight that follows. We lost a lot of time there. All in all, there are just too many unfavourable combinations of passages at Laguna Seca with only two turns that suit us. The layout is really not made for us at all, but the track itself is pretty cool. It was my first time there, and racing around the ‘Corkscrew’ was amazing. Unfortunately, Kyle could only post one hot lap. Something went wrong while refuelling, and we ran out of petrol on only our second hot lap. We were able to solve the problem in time for the race. We could have perhaps finished one or two positions higher up the field had things gone more smoothly in the quali, but it would probably not have had much of an impact on the end result, since we lacked performance. How did your race go? There was a lot of jockeying for position after a restart, and Kyle was, unfortunately, right in the thick of it. He was pushed off track and was lucky to be able to continue. The car wasn’t damaged, but we were in last place. We decided to deploy a different strategy to that used by the opposition and came in very late for the pit stop. Kyle handed the car over to me in second place. My stint lasted an hour and 20 minutes, about half the race. Our rivals cruised past me during my stint. Like the driver in our sister car, I could neither defend nor attack. I was sixth as I pitted for our last stop, coming in at the same time as our sister car. I had to stop further in front of my team-mates to make enough space in the pits for the two cars. Unfortunately, I pulled too far forward, causing problems for the crew trying to refuel the car. That cost us about 30 seconds. But for that glitch, we might have finished eighth instead of tenth. Still, that wouldn’t have made the weekend any better. Let’s not dwell on the past but look ahead! You will be lining up in the Aston Martin prepared by R Motorsport in the season finale of the Blancpain GT Series Endurance Cup in Barcelona (28th – 30th September). I’m already really looking forward to it. I like the circuit. It’s on my list of top ten personal favourites. I did quite well in last year’s Blancpain finale. The track has now been re-surfaced, and I’ve already tried it out. Previously, tyre degradation used to be bad but is now much improved, which should suit the Aston Martin. The track hasn’t got any faster, though. Endurance races are always unpredictable, because there are so many cars and very few overtaking opportunities. Still, I will definitely do my best.